Beginning in April 2015 I began posting single images of vintage still photos, premium and supplement photos, and postcards—any images that don't fit into the card set galleries that have long been a staple of Immortal Ephemera. Links to each are collected on this single index page for easy reference and discovery. Note: Classic Movie Daily subscribers receive images such as these in their daily email. Items are listed in alphabetical order, generally by first name of whoever is pictured. There are enough exceptions to that rule that your best bet for finding a specific photo subject would be using your browser's find function (Edit->Find in Firefox). All vintage studio photography is included under this heading. Vintage promotional photographs, still scenes from the films, and press photos used in publication of magazines and newsletters. The photos found under this heading are mass-produced real photographs most commonly measuring 5" X 7". 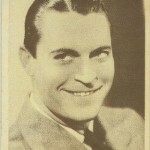 They are the type of photo that fans of the period would receive back in the mail upon writing their favorite star in care of their movie studio. Premiums and supplements are mass-produced items typically printed on paper that were either distributed in theaters, newspapers and magazines, or with various products. A collection of postcard images from various companies mostly located in America, Great Britain, or Germany, with some exceptions. These are post collecting clippings from old newspapers and movie magazines found across the web. Go HERE to view all Image posts in standard archive form with thumbnail image and brief description included (Clippings not included and listed separately HERE).